It has become a sad reality in present-day filmmaking that sequels are often produced with twice the budget and half the creativity of the films that preceded them. This summer, Shrek 2 is the first of many attempts from Hollywood that hopes to avoid this typical fate. Luring back Mike Myers, Eddie Murphy, and Cameron Diaz as its principal voice talent (each for a reported ten-million dollar salary  a record for an animated film and over three times the amount they made for the original), Shrek 2 essentially picks up where Shrek left off. 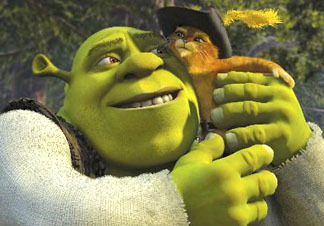 Shrek (Myers) and his newly ogre-fied bride, Princess Fiona (Diaz), return from their honeymoon (to a gingerbread house, no less), only to be summoned by Fiona's royal parents (John Cleese and Julie Andrews) to the "kingdom of far, far away" The king and queen are far from impressed in their daughter's choice of husband and Shrek runs into more complications from a jilted Prince Charming (Rupert Everett), a scheming Fairy Godmother (Jennifer Saunders) and a feline assassin (a, for once, intentionally hilarious Antonio Banderas). The array of new characters all live up to the originals and the truly spectacular animation takes a backseat to a clever screenplay sprinkled with pop-culture references and satires of other fairy tales, both traditional (Pinocchio) and modern (Pretty Woman).